Matthew R. Hall joined Moore Ingram Johnson & Steele in 2016 as an associate in the firm’s Lexington, Kentucky office. Practicing primarily in Workers’ Compensation Defense and Insurance Defense, Matthew is a member of the firm’s Civil Litigation department. Born April 21, 1986 in Paducah, Kentucky, Matthew moved to Lexington to attend the University of Kentucky where he graduated with a Bachelor of Arts degree in Psychology in 2008. He then attended the University of Kentucky College of Law, where he was a member of the Kentucky Law Journal. 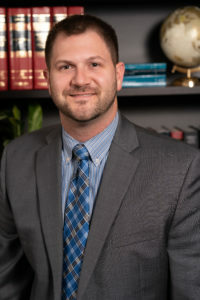 After graduating from law school in 2012 and passing the Kentucky Bar Exam, Matthew moved to Pikeville, Kentucky, where he practiced with an insurance defense firm that primarily handled medical malpractice cases and served as exclusive counsel for the local regional hospital. In 2014, Matthew joined a solo practitioner’s firm in Pikeville where he worked in numerous fields doing plaintiff’s work, including civil litigation, workers’ compensation, and social security. This work saw him practice throughout eastern Kentucky. Matthew is admitted to practice in Kentucky and permitted to appear before the federal court of Eastern Kentucky. He is a member of the Kentucky Bar Association. He and his wife Taylor, a registered nurse, live in Lexington. He enjoys playing rock guitar, watching auto racing, and cheering for the Kentucky Wildcats.